Self-esteem issues are a big problem facing today’s teens. Everywhere they look, on television, in movies and in magazines, teens are bombarded with images of beautiful faces, “perfect” bodies and glamorous lives. Social media is also full of pictures of flawless figures leading lives of luxury and excess. Teens are led to believe that this is normal and that somehow they are less than acceptable because they do not look like the images they see. A self-esteem retreat could be a wonderful way to combat the negative images and role models and instruct teens to understand what is beautiful and acceptable in each of them. 13 For it was You who created my inward parts; You knit me together in my mother’s womb. 14 I will praise You because I have been remarkably and wonderfully made. Your works are wonderful, and I know this very well. 15 My bones were not hidden from You when I was made in secret, when I was formed in the depths of the earth. 16 Your eyes saw me when I was formless; all my days were written in Your book and planned before a single one of them began. 17 God, how difficult Your thoughts are-for me to comprehend; how vast their sum is! 18 If I counted them, they would outnumber the grains of sand; when I wake up, I am still with You. These verses would make a wonderful focal passage on which to base the idea that teens are precious and outwardly perfect as they are because they have been carefully crafted by God. 8 For you are saved by grace through faith, and this is not from yourselves; it is God’s gift— 9 not from works, so that no one can boast. 10 For we are His creation, created in Christ Jesus for good works, which God prepared ahead of time so that we should walk in them. This passage in Ephesians is perfect for stressing the fact that not only have we been created by God, but we have been created in Christ Jesus for a purpose. Teens long to fit in and feel valued. Knowing that they have been created by God to serve a definite purpose will go a long way in their seeing their overall worth as a human being. 13 For I can do everything through Christ, who gives me strength. It is vitally important for teens to know that they can fulfill their purpose in life through Christ’s strength. This passage of scripture can be used to teach that God not only creates us and gives us a purpose, but He also gives us the strength to complete that purpose through his Son, Jesus Christ. This activity is fairly self-explanatory. One of the first things the young attendees should be instructed to do is to write a letter to themselves. They should be completely honest in the letter, describing the things they love and hate about themselves. These letters should not be shared but should be put into envelopes and placed in a box until the end of the retreat. At the end of the retreat, attendees will write another letter to themselves, with the new letter based on what they have learned about their worth from God’s perspective. These can be shared or kept private. The first letters should be redistributed and collectively burned at a celebratory bonfire as a symbol of the teens’ new view of themselves and their self-worth. This game is great for teens to get to know each other, but also important to get them to look inside themselves. A Jenga game or other tower stacking game is needed for this activity as well as some printable tabs. Instructions and printables for the “Get to know you” Jenga game can be found here. This is a wonderful activity to get teens to focus on their positive inward and outward attributes. All that is needed for this is a device with video capability. Give the teens 30 to 60 seconds of “commercial” time to sell themselves to a potential client or employer. For this activity, give the teen attendees access to fashion magazines and health and fitness magazines (be sure to weed out any inappropriate content beforehand.) Allow the teens to go through the magazines and find positive words or images that describe them or what they wish to be or accomplish. Have the teens create a collage with those images that they can hang on a wall at home to remind them of their value to Christ and their purpose in God’s plan. The Q&A checklist found here is a useful tool to get teens thinking and talking about what self-esteem is and how they truly feel about themselves. The questions are simple and can be easily adapted to fit a Christ-centered format. This ad campaign was brought out several years ago by the Unilever Corporation, the makers of Dove products. It offers many excellent tools for showing teens the reality of what they see in advertising and what goes into making models look perfect. Teens can benefit from seeing that the images they view are unrealistic portrayals of how real people look. There are also videos available on Youtube that show the process of using lighting, makeup and digital enhancement tools to create the flawless images they see in advertising. Hold a show that features unusual skills rather than the regular offerings of singing, dancing, etc. Keep it casual and lighthearted to celebrate the special hidden talents that the attendees choose to showcase. For instance, they might show off a skill of reciting Pi or singing the alphabet backward. By showcasing and applauding the quirky, silly things they can do, teens can learn to appreciate their own God-given uniqueness. The teenage years are difficult enough without being plagued by constant self-doubt. By showing teens how God created them and gave them a purpose, they can begin to see beyond any supposed flaws they have on the outside. 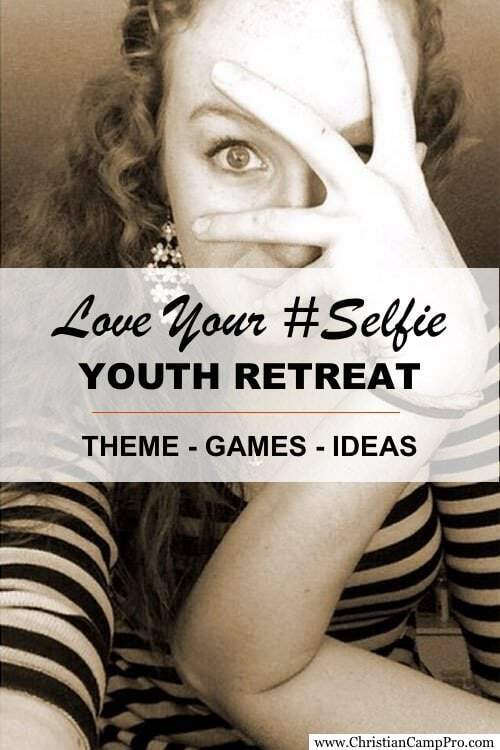 A Love Your Selfie retreat can be a wonderful way to help teens navigate what they see through advertisements and entertainment and weigh the images they have of themselves against what God says about them in His Word. This Love Your Selfie theme was made possible by Refreshing Mountain.